I'm heading to the Peruvian Amazon this morning and will be out of reach for the next 12 days. I'm volunteering for Earthwatch at the Tambopata Research Centre on a macaw biology and conservation study being conducted by Dr. Don Brightsmith. I'll be assisting in field work that focuses mainly on three species of macaws - blue and yellow, scarlet and red and green and their interaction and use of clay licks. The clay licks at Tambopata are among the world's largest and host hundreds of birds representing 18 parrot species and the research area is home to over 500 species of birds -- so I hope to bring back some good shots. The area also holds the record for the most species of butterflies and tiger beetles and I hope to find a few of those for Doug Taron at Gossamer Tapestry. I'll be back with Amazon posts and more Nicaragua in about two weeks. See you then. Safe travels, Tim! I'm already hyperventilating over the bird shots I imagine you'll get. Traveling mercies!! Sounds like such a fabulous trip--can't wait to see the pictures. We finally find you and you leave us. Be safe Mr.T. T.R., Have a safe trip. I can't wait to see the photos. I can't imagine seeing 500 species of birds, and then there are the butterflies to boot! Doug is probably drooling right now! If I were you, I'd check my bags for a stowaway! Nice malachite! The color reflects how I'm feeling about your trip to Peru. It's been about 15 years since I've been to Puerto Maldonado. 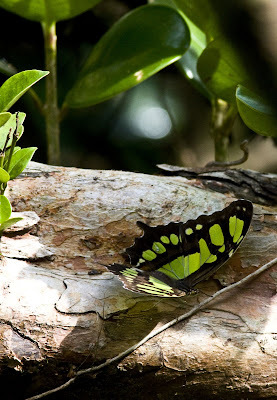 The butterfly collecting was outstanding there- best tropical butterfly experience I've ever had. I often look back at that trip with a bit of regret that I had not started exploring other groups of insects yet. I recall a lot of clearwing butterflies there, including one whose wings looked like they were made from yellow cellophane. Fingers crossed that you get some nice tiger beetle photos. Safe travels to you. I am constantly amazed at your photos and writing. Ypu have helped to ignite my joy of travel, which is so easy to foret in our industry. You inspire me to look at the wolrd differently!! "Nice malachite! The color reflects how I'm feeling about your trip to Peru"
Have a safe trip. I can hardly wait to see your photos. you weren't kidding when you said you wanted to be JZ when you grew up! Thanks for the comment! That's pretty wild! Yes - I agree - the world is shrinking! I found Sulutsu's blog by searching for blogs authored by Native Americans. They are pretty rare - good ones that aren't overrun with ads. I think I drive him crazy trying to pitch my ideas to him on how to take his blog to the next level. He has great content and photos. There is so much originality out there, but I find his blog especially unique. My husband is Native American and my children are the tribal roll - Achumawi of Northern California. I've visited your blog a few times when Jean mentioned you. That is so funny that you didn't see the fine print either! What an exciting time you're having- from Siberia to the Amazon. Can't wait to see your rainforest bird pics and see the tropical paradise through your eyes. By the way, your sidebar of the traveler's cultural tips are worth re-reading. No wonder people are always smiling in your photos. You are a good ambassador, TR. Can't wait to see your 'Peruvian' posts! I'm tagging you with a meme that will post at my site on Saturday. I hope you'll come visit and play along.